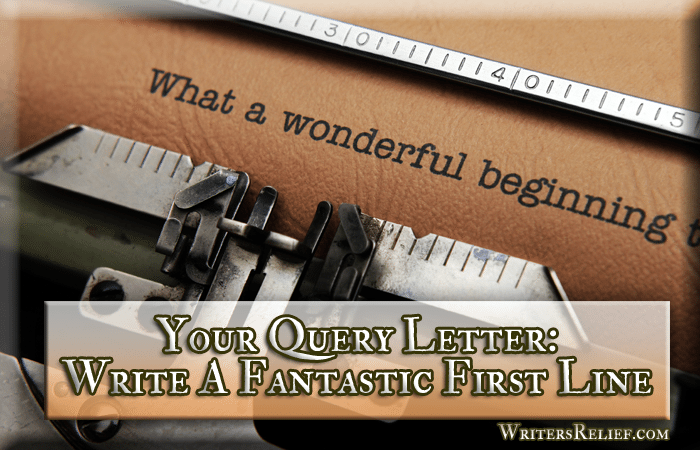 Your Query Letter: Write A Fantastic First Line - Writer's Relief, Inc. Please consider my 90,000-word science fiction novel, Night Storm. However, if your book lends itself to a quick summary, you might consider using a log line to open your query letter. A log line is a very short description of the characters and main action of your book. If used appropriately, a log line or brief summary in the beginning of your query letter will capture not only the core story of your book, but also its essential energy and momentum. Please consider my 90,000-word science fiction novel, Night Storm, the story of a shy fifteen-year-old boy who must save his small Midwestern town after a mysterious thunderstorm causes his father and others to go missing. I hope you’ll be intrigued by the proposal for my book Breaking The Rules, which teaches people how to free themselves from years of ingrained bad habits. The trouble with introducing your book with a summary in your query letter’s first line is that it’s really hard to do well. And if you start with a not-so-great opening line, you might lose your reader’s interest before he or she even gets to the second sentence. Please consider my 90,000-word science fiction novel, Night Storm, a story of alien abductions during thunderstorms, father-son relationships, and a boy’s quest to save the world. In the above example, each element of the book’s plot is presented in a way that feels more “nouny” than “verby.” There’s no momentum. Goes on too long or just doesn’t grab the reader’s attention. Some books simply don’t lend themselves well to summary, and forcing the issue can hurt more than it helps. Excerpted quotes from characters or descriptive passages. Some writers pick out a favorite book passage and plunk it down right at the beginning of the query letter. We don’t recommend this strategy. Few agents will wade through your character’s speech to get to the basic information (genre, title, word count) that the query letter should have started with. Plus, just because a certain snippet resonates with you, doesn’t mean it will resonate the same way with agents. As the writer, you have an emotional attachment to the characters and the action. Agents don’t. And it’s rare that a line (or three) will instantly create a deep level of attachment. The rhetorical question. You’ve seen this one before: What would you do if you discovered your spouse was cheating? What would you do if you were a trained assassin and your next target was your best friend? Unless your rhetorical question is really good, skip it. The “cheating spouse” angle has been explored ad infinitum—so this rhetorical question doesn’t add anything new. And few people ever think of themselves as trained assassins. Only use a rhetorical question if it is engaging in a very specific and emotionally surprising way. The big promise. Some writers will start their queries with a spectacular statement: My book, Title Here, is the next Harry Potter, the next Hunger Games, the next Gone Girl—and I hope you’ll get back to me ASAP to let me know if you’ll want it before Oprah does. Agents are unimpressed—and a bit put off—by hubris; don’t give agents a negative impression of you or your book in the very first line! Is A Log Line Right For Your Query Letter? If you want to try for a log line-esque summary in the first lines of your query letter, be sure you focus on what’s surprising and magnetic about your story. Then write your descriptive phrase over and over again until you get it exactly right. And if you’re even a little concerned that your log line might not be deeply compelling—leave it out. Better to start your query letter with a simple statement of the facts than to hurt your chances with a first line that flops. QUESTION: What would a log line or short summary of your book look like? Free fee to post in comments! That takes us up to the next level. Great points. “Yes Virginia there is a SYBIL, I lived with her in 1990 north of Kansas City. My narrative non-fiction THE ANGELS WITHIN is a completed 82,000 word novel. I believe it will be the first in a series much like Armistead Maupin’s Tales of the City set in the Midwest. Overworked on set of her last scene, stressed with details of her wedding tomorrow, 24 year old actress Cine, daughter of a silver spoon, Hollywood royalty family, sits in LA rush hour traffic waiting for AAA assistance in her stalled convertible, already a half hour late for wedding rehearsal. Sorting through unread mail, she finds a letter, postmarked Italia, naming her heir of a dearly departed, unknown relative. Enchanted by the sweet aroma, delicate velum, and mysterious appeal of the letter, she decides there are things she needs to do before the wedding. Kind of hard to say how many words this will be, as it took about 13,000 words just to get to the first night, and it promises to be a multi-volume saga. Short summary of the book must be attractive as the lotus bud with the brief attractive contents as if the coloring light of rising Sun and the end point must be mind touching like lotus flower with the color of setting Sun mixed with rising moon of full moon light. If no one will tell me I have no idea if my query letter has ANY faults.